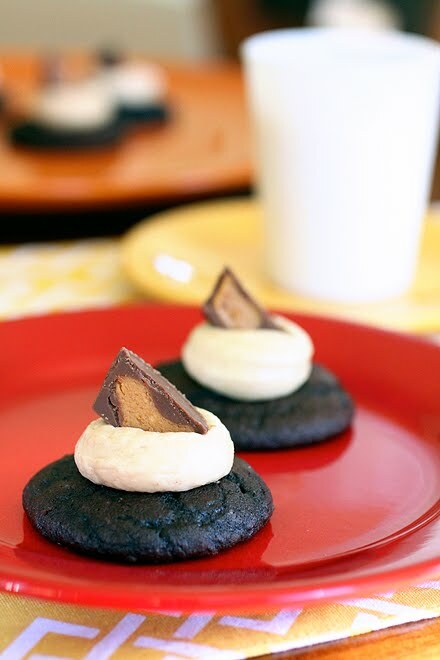 These cookies are more like tiny cakes with a dollop of fluffy peanut butter frosting on top. The frosting alone is worth making as a topping for other baked goods, or as my mom does, on graham cracker sandwiches. 1. Line two cookie sheets with parchment and preheat the oven to 375 degrees. 2. Place all the ingredients except the cake mix in a mixing bowl and beat well to combine. Add the cake mix and mix just until incorporated. Scoop with a standard (size 50) cookie scoop 2 inches apart onto parchment. Bake for 9 to 10 minutes or until no longer wet looking. Rest on the cookie sheet for a couple minutes and then move to a cooling rack. 3. Once cool pipe with Peanut Butter Frosting, garnish top with half a peanut butter cup. This stuff is so good you might as well just skip the cookies and dig into the frosting. Beat the ingredients together with a mixer starting with 1/3 cup milk. Mix well and add more milk if needed. Beat on high speed for 4 more minutes until fluffy. Laura, You simply can't go wrong with peanut butter cups! Your p. butter frosting sound delicious too! I need to make this like now. Like this second. This frosting seems dangerous. Which really means I plan on making it and eating it all within the next 48 hours. Holy yum. Peanut butter and chocolate. A match made in heaven! Laura, these sound like they would taste heavenly...but my goodness...they look out of this world! You did such a wonderful job with your presentation. These should be on the cover of a magazine. Thanks for sharing! They really do look melt-in-your-mouth heavenly!!! Ohhh I love the fluffy peanut butter frosting. These look great! Peanut butter and chocolate is one of my family's favorite combos, so I know these would be a huge hit! Loving your "rebellious" style and tips on using cake mixes to bake cookies with! one thing though... on your tabbed menu under "cookies" when you click 'cake mix cookies' it brings you to posts tagged as 'cookie mix cookies', and then vise versa when you click for 'cookie mix cookies' it brings you to posts tagged as 'cake mix cookies'... I mean, hey, maybe that was one purpose but if not... now you know! Thank-you for the info! I hope it's fixed now.